WoodLink provides a unique and innovative products since 1988. 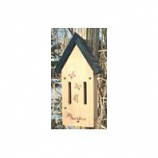 • Two Swirling Perches Makes It Easy To Clean and Fill. • Hand-Crafted Of Zinc Chromate Screws and Made In The Usa! • Easy To Fill and Clean. Handcrafted out of natural cedar with 2 specifically designed butterfly openings. Easy to open and clean. Made in the usa. . .
• Four Swirling Perches Makes It Easy To Clean and Fill. • Hand-Crafted Of Zinc Chromate Screws and Made In The Usa!!! • Heavy Steel Cables With Deep Green Plastic Coating and S Hook For Easy Hanging.